The Lovers also includes Adam [Heb, adahm, which means “earth creature”] and the woman [Heb. ishshah, which simply means “woman” The name “Eve” does not appear until Genesis 4:1]. The artwork suggests that this is pre-Fall where they have a choice between eating of the Tree of the Knowledge of Good and Evil [which is right behind the woman with the serpent entwined around it] or not. Waite states the meaning of this card quite beautifully, “The figures suggest youth, virginity, innocence and love before it is contaminated by gross material desire.” It’s interesting to note that in the passage I quoted at the beginning of this post, the “blame game” has commenced: The Divine Presence blames the man, the man blames the woman, the woman blames the snake. This is what happens when love fall apart. It get’s pretty nasty sometimes. Seen in this context, The Lovers points to so much more than physical love. Ellen Canon Reed, in her magnificent book, The Witches Tarot, echoes this deeper meaning of the card. “The Lovers is a title which has caused many mistakes in interpretation, for we tend to think of lovers only as those involved romantically. A lover is one who loves, and that means all loving relationships, including the threefold relationship depicted on the card. 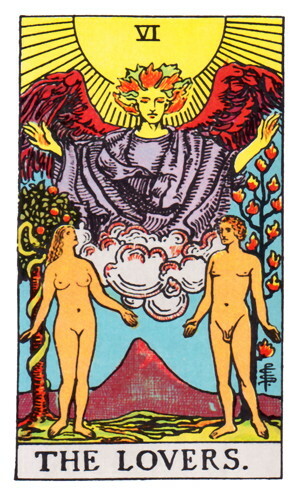 All three figures on the card are you: The man is your Personality, the woman is your Individuality, the other figure is your Spirit.” This is quite an interesting way to reflect on the meaning of the card and what it is saying to you. So when The Lovers appears in a reading it may be calling us to be careful as to who and how we love. It calls us to be “lovers” in the fullest sense of the word where our love for other people and creation is never exploitive or abusive, but is healing and transformative. It is a powerful card, indeed. 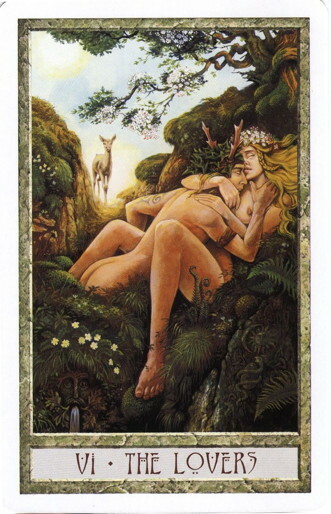 This entry was posted in Tarot and tagged Christian, Tarot, The Lovers, Wicca. Bookmark the permalink.